Home > A Brief History of Environmental Litigation Group P.C. A Brief History of Environmental Litigation Group P.C. We were formed initially as an asbestos firm in 1990. Bill Lewis, whose father died as a result of asbestos exposure after working in the shipyards of Mobile, Alabama, left his very successful tax practice at that time to start Environmental Litigation Group P.C. From the beginning, our law firm was dedicated solely to helping asbestos victims. Asbestos litigation is still our main practice on a day-to-day basis, however we have expanded our practice to toxic tort and community exposure cases. We began our activity in 1990, among the first law firms decided to bring the serious issue of asbestos to public attention. Our firm started when our founder, Bill Lewis, the owner of a successful tax practice, decided to represent asbestos cases and to help victims receive their rightful compensation. The reason he began to pursue asbestos cases was that his own father suffered and died from complications due to an asbestos-related disease. His search for justice led him to start our firm's activity and to represent many cases similar to his father's. The Owner of Environmental Litigation Group P.C. Gregory Cade started his activity at our law firm as a paralegal in 1992. While striving to get his Master's Degree in Industrial Hygiene, Greg became one of the foremost drivers in the development of the firm. After achieving his Law Degree, Greg went on to establish a successful solo practice. Years later, when Bill Lewis decided to retire, he asked Greg to come back and lead the firm. Eventually, in 2010, Gregory Cade became the owner of Environmental Litigation Group P.C..
Asbestos has been used all over the country and Alabama, with more than 50 major industrial sites in the Birmingham area alone, was one of the most prolific states. We started off with 50 clients and within 4-5 years, we were representing over 8,000 clients. As the firm quickly grew, we became experts in matters of environmental litigation. In our first years, many asbestos victims were compensated large amounts of money in litigation against asbestos companies due to our successful trial groups in 1999-2000. Unfortunately, in the early 2000's, after liability and losing court cases seriously hampered their profits, these asbestos companies were allowed to declare bankruptcy with the condition that they take care of their creditors. The asbestos victims are classified as creditors, not only the current victims, but also the future ones. Currently, there are 26 major asbestos trusts and many smaller ones all across the nation. When our original owner retired, our firm went into a multiple partnership. Five years later, the firm is now owned by a single attorney, Greg Cade. As a paralegal, Greg became more involved in developing the scope and direction of Environmental Litigation Group P.C.. Greg's original plan was to have a better understanding of the science behind toxic exposure as he began work on his Master's Degree in Industrial Hygiene. Now, Greg is an expert in the legal and scientific fields of toxic exposure. There are still some viable companies that we litigate, but we now predominantly file claims in the bankruptcy trusts against accountable companies. Until a few years ago, we focused on the Southeast. Now we represent clients from all over the country. With a dedicated staff of nearly 40 people and with the help of our specialists, we represent our own cases that deal with the complex system of asbestos litigation. Over the years, we have built an extensive database of over 200,000 records. The records place manufacturers and products in specific sites. The development of these records is a key component to our success. One of our most important guidelines is that we don't assume anything. Instead, we ask, we record and we research, thus getting to know our cases to the last detail. On a personal level, representing a client in an asbestos case also means building a trust-based relationship with each of them. 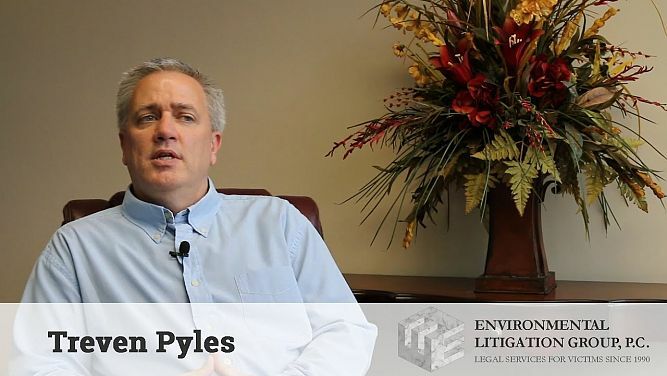 This page was last updated on April 10th, 2019 PST by Treven Pyles at Environmental Litigation Group, P.C.